Please try only the best Japanese foods! Chitosekan prides itself on serving the best Japanese food. Please join us for dinner or lunch to experience our food yourself. 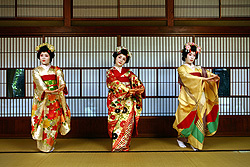 Chitosekan is a Traditional Japanese Restaurant with Traditional Japanese entertainment by Yamagata Maiko. Make each dish a unique experience! Use Fresh and Organic foods. Provide a balanced mixture of traditional and modern. 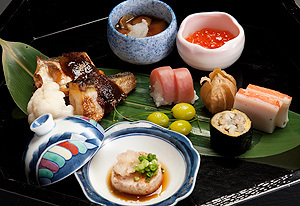 All meals use seasonal produce to represent Yamagata foods! 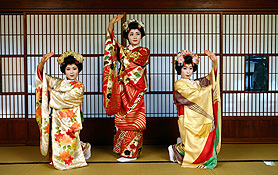 Please for when the Maiko are available, before you arrive at Chitosekan. No need to tip Maiko. Enjoy their dancing, music, and conversations! 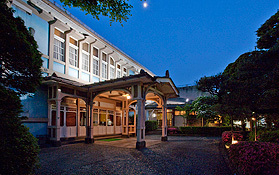 We accept Visa, MasterCard, JCB, American Express, Diners Club, Nicos, and 銀聯 card*. *We will start accepting this card in Spring 2011. Chitosekan, a traditional Japanese restaurant located in Yamagata, Japan, has a great architectural building and serves customers with high quality meals and beverages. If you have a chance to travel to northern Japan, don’t miss dining with us at Chitosekan!